For road going cyclists this is the MET Scatto Helmet: The ideal halmet for serious cyclists, its sleek design is an added bonus to its impressive comfort. 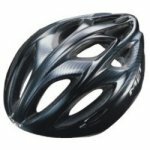 The excellent ventilation keeps you fresh and the road goes faster under your wheels. Innovative design. In-molded construction. Safe-T Lite. Rear Vents. 15 Large Vents. In-molded anti-insect net. .Soft anti-allergic washable pads. Reflective stickers. Lockable side-straps divider. Anti Pinch Buckle. 270g.